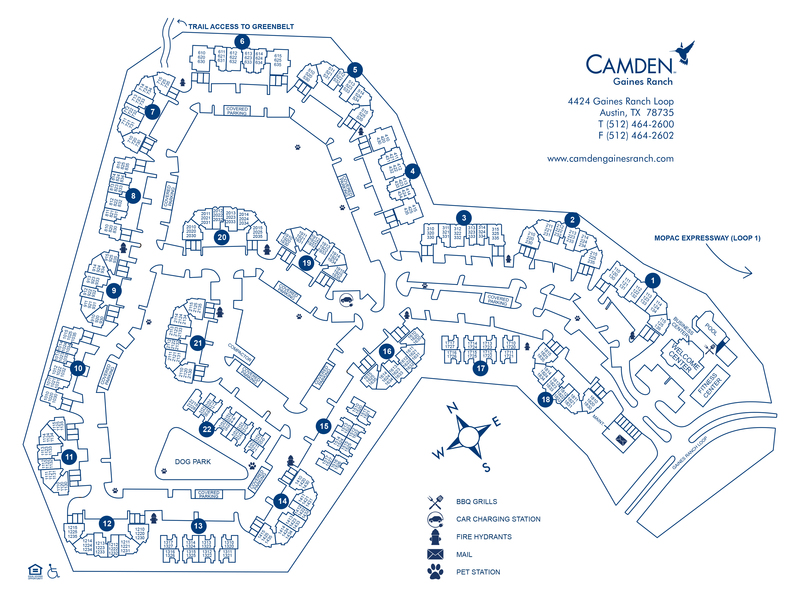 Camden Gaines Ranch offers one and two bedroom apartment homes in Austin, TX located on the Barton Creek Greenbelt. Every beautiful apartment home includes high-speed internet and WiFi, cable TV, stainless steel appliances and granite countertops. Select apartments feature greenbelt views and walk-in showers. If you need a little extra space, we offer private garages with storage. After a long day, come home and relax by the pool and outdoor lounge areas. If you are looking for a more active lifestyle, we have a 24-hour fitness center as well as direct access to walking trails and nature preserves. We have perks for your pet too! Our community features a private dog park. Plus we've got electric car charging stations available for residents. Residents receive a technology package included in the total monthly rent with a savings of up to 58% off retail. This money-saving package includes high-speed internet up to 300 Mbps and 225+ channels including over 120 HD channels and HBO. Looking for more options? Access Spectrum and HBO Go from your smart device + over 250,000 Spectrum WiFi hotspots nationwide. For those who work as hard as they play, you will love the convenience of living just three miles from Barton Creek Square and 15 minutes from Downtown Austin. Mopac Expressway, Southwest Parkway and Highway 290 are minutes away with quick access to lots of great shopping and dining at Barton Creek Square Mall and Sunset Valley Shopping Village Center. At Camden Gaines Ranch, you can have it all! Breed Restrictions: American Pit Bull Terrier, American Staffordshire Terrier, Staffordshire Bull Terrier, any mix of the previous breeds, or any other dog or breed deemed aggressive. Get the perfect spot! We have ample open parking for our residents and visitors on a first-come, first-served basis. Garages are available for you to rent! Detached garages are $105 per month. Carports are available for $45 per month.